Rojak is a vegetable and fruit salad commonly served in Indonesia, Singapore and Malaysia. The vegetables and fruits in rojak are tossed with a thick, brown sauce. Rojak sauce has the consistency of melted caramel and a complex, sweet, salty and spicy flavor. You can find the ingredients to make rojak sauce at your local Asian market or natural foods grocer. You will need approximately 25 minutes to make rojak sauce, plus an additional 30 minutes for it to cool. This recipe makes 1/2 cup of rojak sauce. Pour the water into the saucepan and place it over high heat. Bring the water to a boil and reduce the heat to low. Add the dark brown sugar to the saucepan and stir with a whisk until it dissolves. Add the oyster sauce, shrimp paste and tamarind paste to the saucepan and continue whisking for two minutes. Stir the Scotch bonnet pepper into the contents of the saucepan and simmer the mixture for 10 minutes. Remove the saucepan from the heat and allow the sauce to cool for 30 minutes or to room temperature before tossing with rojak. 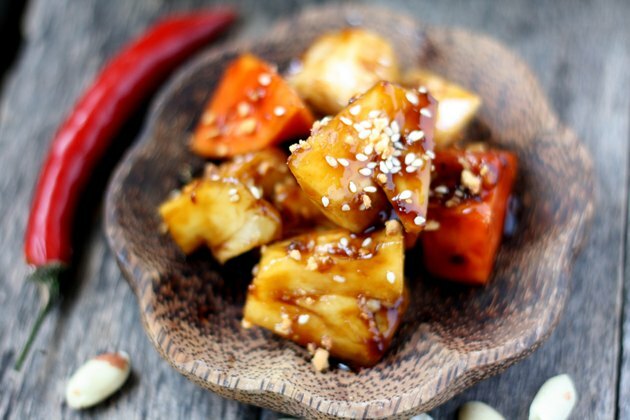 Refrigerate or freeze leftover rojak sauce immediately. Consume refrigerated sauce within five days and frozen sauce within three months.